President Muhammadu Buhari has taken an early lead as vote counting continues in Nigeria’s general election, winning four of the country’s 36 states. Mr Buhari took two states in the southwest, one in the east and one in Nigeria’s centre, while his rival Atiku Abubakar took the capital Abuja. As results came in, Mr Abubakar’s People’s Democratic Party (PDP) alleged there were irregularities in the vote. 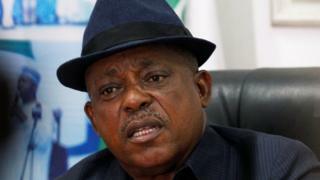 Party chair Uche Secondus called the count “incorrect and unacceptable”. He claimed there was an “attempt by the government and other agencies to manipulate the result”, but did not give any evidence of manipulation. The EU, US and African Union have all expressed concern about delays and logistical problems with voting on Saturday, but no independent observers have suggested there was vote rigging. Mr Buhari, a member of the All Progressives Congress (APC) party, is seeking a second term but faces a strong challenge from Mr Abubakar. Both parties have claimed the other is working with the Independent National Electoral Commission (Inec) to influence the outcome of the vote, which was initially scheduled for 16 February but delayed at the last minute. Neither party has substantiated the allegations. Mr Buhari has promised to take Nigeria to the “next level” and said he would build on his accomplishments so far, while Mr Abubakar, a business tycoon, has accused the president of wasting his term in office and has pledged to get the country working again. Whoever wins in Africa’s most populous nation and largest economy will have to address a range of problems including power shortages, corruption, security threats, and an economic slowdown. As well as the four states won by Mr Buhari and Mr Abubakar’s win in the capital, provisional results suggested Mr Buhari had also taken Yobe state in the north east, while Mr Abubakar had won the southwestern state of Ondo. Final results are not expected until later in the week. But the PDP party chair, Mr Secondus has already criticised the initial tallies, claiming that the governing party was using “impeachments, manipulation, incarceration” to influence the results. He told reporters it would be difficult for Nigeria “to accept this level of intimidation”. In turn, the federal government accused the PDP of trying to “scuttle the polls” and prompt a constitutional crisis. Lai Mohammed, minister of information and culture, said the PDP had showed “disdain for the electoral process”. Most of the country was calm but there were reports of attacks by the Boko Haram Islamist militant group in the north, and voter intimidation and attempts to steal ballot boxes from some polling stations, especially in the southern states of Rivers, Lagos, and Anambra. A coalition of civil society groups reported that a total of 16 people were killed around the country – less than in previous elections. Two people were arrested in the Surulere district of the commercial capital, Lagos, after voters were attacked by a group of young men “brandishing weapons: cutlasses, axes and stakes”, eyewitness Ralph Onodike told the BBC. “What they were saying was that if you were not [voting for the ruling party] APC, you’ll be attacked,” Mr Onodike, who sustained an arm injury, said. Inec said that voting had not been possible in about 8,500 of the 120,000 polling stations around the country, the AFP news agency reported. But Inec official Festus Okoye said the commission was “generally satisfied with the process and the procedures for the conduct of these present elections”. He said 68% of polling units had opened by 10:00. The initial vote was rescheduled in a dramatic press conference in the early hours of Saturday 16 February, just five hours before polls were due to have opened. Voters were also choosing members of the House of Representatives and Senate. The candidate with the most votes is declared the winner in the first round, as long as that person gains at least 25% of the votes in two-thirds of Nigeria’s 36 states. There are 73 registered candidates in the presidential election, but campaigning has been dominated by the two political giants and the established party machines behind them. Both candidates are from the mainly Muslim north of the country. They are both in their 70s, while more than half of Nigeria’s 84 million registered voters are under 35. Until 1999 Nigeria was governed by either short-lived civilian administrations or military rulers. But this year marks 20 years since the return of democracy. Nigerian migrants: Why are numbers to Europe dropping?